Jim C. Hines is best known as the author behind the Jig the Goblin series of misadventures. The Jig series is as solid as humorous adventure fantasy can get and I'd even go so far as to say they are better than Asprin's MythAdventures. Give them a try if you haven't already, starting with Goblin Quest, which is sure to remind people of a D & D game gone awry. My love of the Goblin books is why I decided to give The Stepsister Scheme a try. Princess fairy tales. Girly right? Not in the hands of Mr. Hines. There is hardly anything girly about this story and these women. Hines seems to have almost effortlessly morphed these so-called Disney Princesses into heroines a la Charlie's Angels of the highest order. Most fairy tales have a much darker origin than many people realize and some are down right nasty. For example, think about Hansel and Gretel for a second. That old woman wanted to fatten those children up in order to eat them. Can you get much more ghoulish than that? The humor isn't as plentiful as in the Goblin books, but these are much more serious characters and situations. To start you have Danielle (Cinderella) who has fallen into palace life with her two Wicked Stepsister still causing trouble. Than you have Talia (Sleeping Beauty) who is about as hard as nails as you can get, but understandably so. Lastly, but certainly not least is Snow who is sort of the balance between the other two, while also being powerful magician in her own right and nasty with her snowflake throwing starts. There is also Queen Beatrice, whose character is not explored much, but I'm sure it will come up as the world progresses. I have a feeling Hines has a lot in store for the world building, but he did a worthy job of melding the fairy tales into a comprehensible world as well as creating a Fairy town as fun as I've seen. The Stepsister Scheme is a self-contained rescue mission of a certain price with a few teasers thrown in of stories to come. Hines' style has grown a bit more intricate, but it is still packed full of action and a twisting of the stories we all loved as children. I give The Stepsister Scheme 8 out of 10 Hats. The Mermaid's Madness, the second in the series will be released in early October and judging by its description is sure to raise the ante. 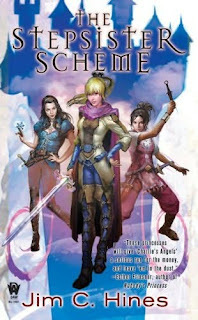 This is Charlie's Angels for the fantasy fan and they'll gobble it up. I loved the Goblin series the Stepsister Scheme was a little bit different then the Goblin series :). I have the Mermaid's sitting on my to read shelf.